There are several ways you can contribute to Mt. Bethel over the web. In all cases, you can create a one-time or recurring transaction, and if you wish to make a gift to a specific area of need, please include your desires in the “Special Instructions” field at the end of the transaction. We use PayPal to process on-line and mobile contributions, gifts, and offerings. 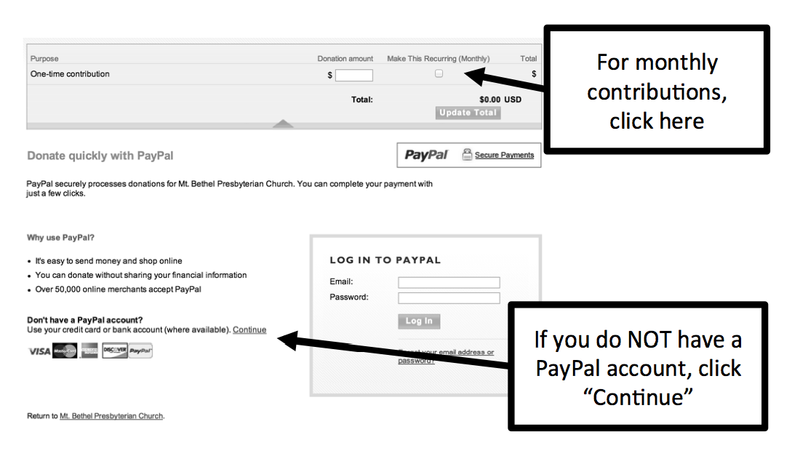 You do NOT need to have a PayPal account to make an offering, you can simply enter your credit card information and PayPal will process it. By default, it will be a ONE-TIME contribution. To make a RECURRING contribution, select the same link above, and click the check-box for “Make This Recurring (Monthly)” (see below). Most banks now offer “Bill-Pay” services where you can schedule monetary transfers from your account to a business or company. In most cases, all you need is the church’s address and phone number and the bank will take care of the rest (if your bank asks for an “account number”, you should be able to leave it blank). Please check with your bank if you have any questions about how your bank’s system works.